Grab your walker, secure your catheter, and make sure there's double adhesive on your dentures! Then hang on for dear life, because you are about to ride along with the covert Senile Squad -- a bunch of elderly cops who refuse to stop catching crooks. Fighting street crime the old-fashioned way is their modus operandi. The Ol' Blues, led by their cigar-chewing Sarge, bring justice back to the streets of Omaha by taking down a brutal Sudanese kingpin who thinks he's a powerful gang lord. Crime fighting has never been so funny or effective when seasoned cops armed only with walkers, canes, and wheelchairs (and some gross tactics) take back the streets. What made the experience of listening to Senile Squad the most enjoyable? Something different, entertaining, thrilling. Love the narrator, too. I love YA, but I have listened to so many stories about kids learning they have super powers that this was a warm and welcome relief. What other book might you compare Senile Squad to and why? Hmm. Not sure there is a comparison yet! What does Michael L. Canaan bring to the story that you wouldn’t experience if you just read the book? His accents, his deep and clear narration is as if he is reading it right to the reader. I love it! The geezers have gone rogue. Funny, thrilling and original. Well done! I love books that make you feel so many emotions through out the book. I literally laughed out loud multiple times and felt myself angry and sad for many of the characters. Very well written and I look forward to the sequel! This book was awesome! It was such a fascinating story line and I really enjoyed all the characters. It was so fun to listen to. I don't necessarily have a favorite character, I think they all worked together really well. Which character – as performed by Michael L. Canaan – was your favorite? Sarge, I think this voice he did was fantastic! I loved the scenes with the piss packs, they had me rolling! Great book, great voices, excellent job by the narrator bringing this book to life! 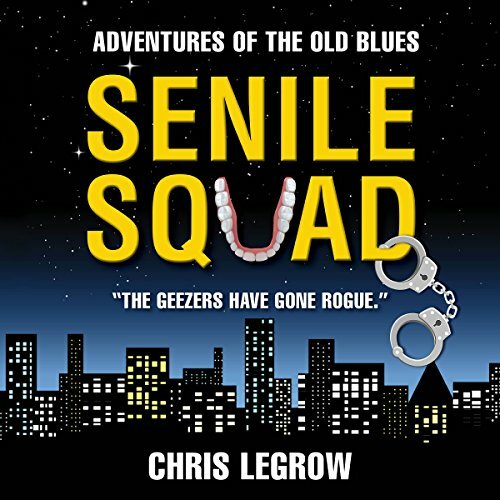 Would you consider the audio edition of Senile Squad to be better than the print version? No, They are each great. The book you can use your imagination for the voices. In the audio edition the speaker uses voices for the different characters, but there are not so many ranges to his voices. Many characters sound alike. Senile Squad is unique. I have never read anything quite like it. That being said, it is easy reading, like Beverly Lewis and Stephanie Meyer's books. It is a comical look at what a Cop's retirement home might look like. Have you listened to any of Michael L. Canaan’s other performances before? How does this one compare? I have never listened to Michael L. Canaan's performances before. I would not be opposed to listening to more of them though. Never underestimate the Ol' Blues! I love to read, but simply do not have time in my life at this point. I decided to try listening to audio books during my commute. It is awesome! I found myself sitting in my car after arriving at my destination because I didn't want to stop listening. I also couldn't wait to get back in the car so I could continue Senile Squad. It is definitely worth getting this book!!! Did you ever buy a ticket only to find someone didn't bother to tell you the facts about the mundane and sometimes just boring passage, characters that are stuck off somewhere between Mae West Wannabes, and clueless.